Once upon a time when I was going through a rough patch in my life, I considered just taking off and walking the length of the Pacific Crest Trail. I figured by the end of the hike, things would be different, or I would. The rough patch passed, as bad times often do, but I have retained that image of hiking the length of the trail. I don’t remember why I chose the Pacific Crest Trail since I was also enamored with the idea of the Appalachian Trail. Perhaps I was confusing the Pacific Crest Trail with the Pacific Coast Highway, and envisioned a walk along the coastline. Surprising to me now is that although I lived in Colorado, I wasn’t aware of the Continental Divide Trail, or if I was aware of it, perhaps it was too close to home to seem romantic. Someday my current responsibilities — looking after my 97-year-old father and dealing with my perhaps bipolar brother — will end, and then what? What will I do? Who will I become? I’ve been checking out various trails in the US, and if I were so inclined, I could spend the rest of my life on foot. 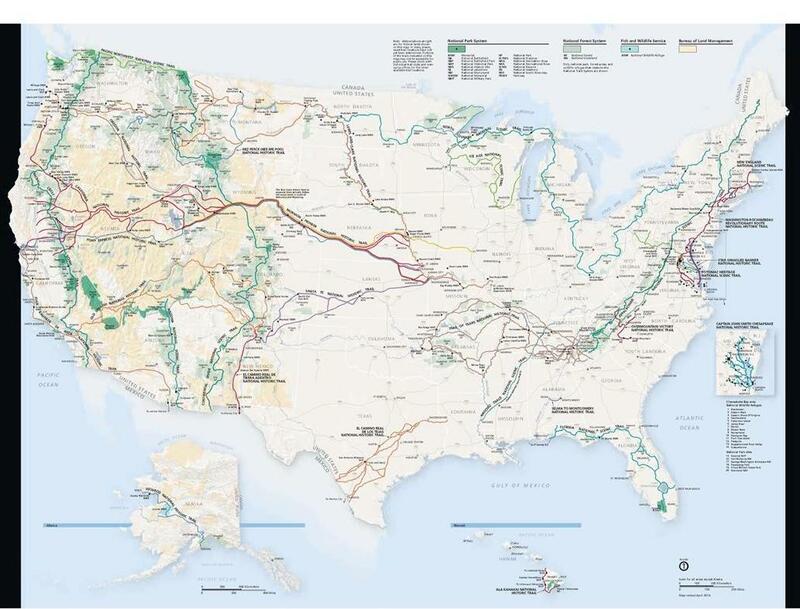 Thirty different trails comprise the National Trails system, and many states seem to have additional trails, such as the Oregon Coast Trail that extends for 400 miles from the Columbia River to the California Border, and the Colorado Trail that runs 486 miles from Waterton Canyon southwest of Denver to Durango. A friend of mine recently bought a motor home, and she plans to live on the road until she finds a place to settle down. That, too, is a romantic idea (also practical), but not for me. I prefer to be less cumbered, to go lightly through life. But so lightly as to live with only that which I can carry or send on ahead? I don’t know. Still, I can’t help wondering. And dreaming . . .
DO IT DO IT DO IT!!!!!! 🙂 No really…DO IT! Do what you can now rather than wait on dreams. Get away for a week, a few days, an afternoon, but get out there somewhere. All trips being with a single step so take one when you can! Good point — doing what I can now. Lots of small steps add up. Sounds as if you’ve got some of the same dreams I do. There’s just something about feet on the ground, even if you are tired, buggy, sweaty, and or all of the above that just comes in as “peak experience” in my book. And I have done that plunge in without prep–in the UK–it was a tough day, let me tell you, without proper footwear and heavy rain, mud, and enormous steep climbs, but I made it. Ever since, all I’ve wanted to do is go back. I might have to start small, doing a day or two at a time to get acclimated before I ever headed out on a national trail. I truly cannot imagine the logistics of a 2,000 mile hike. Yikes. Before arthritis struck I loved going for a walk, but I’ve never been a hiker. We’ve had a number of different RVs through the years, and that’s the way I’ve achieved my ‘getaways’. Being a Snowbird hasn’t appealled to me — can’t envision driving to a trailer park and sitting there for weeks or months — but sightseeing across the country and parking in wilderness places is wonderful. No matter what we choose to do each day, there’s always our familiar rig and comfy accommodations to return to each night. That strikes me as the best of both worlds, but I know owning and maintaining an RV isn’t for everyone. I do hope you’ll find a way to indulge your desire, even if it means starting in smaller ways. Are there other members of your Sierra Club who you can team up with for treks? It sounds as if you had wonderful wildnerness adventures. I’ve been going on tame adventures with a group who hikes a few miles of the PCT every Saturday. It might be all I can ever do, though I would like to do some sort of hike into the wilderness one day, just perhaps not 2,500 miles through some of the USA’s worst weather and roughest terrain. On the other hand, I could start and see how far I got. That could be interesting.